A Chinese woman is now the center of netizen;s uproar after she refused the firefighters’ efforts to break her car’s window to save her son. 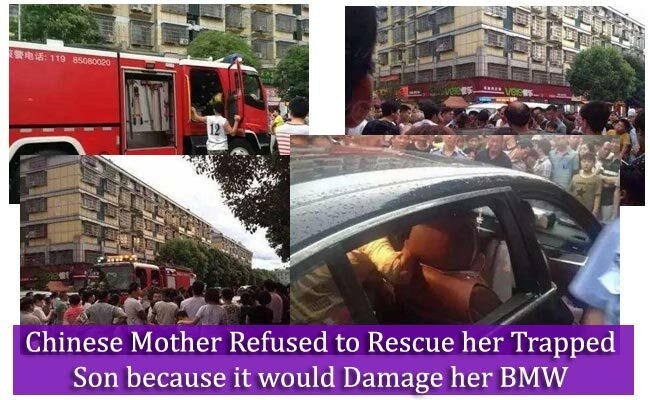 The woman in China had been gathering negative and angry comments on social media as she had prevented the rescuers from immediately rescuing her son locked inside her BMW. The firefighters wanted to break the window but she strongly refused despite that her three year old son in trapped inside. According to the country’s state broadcaster CCTV, the incident took place in Yiwu in Zhejiang province last July 11. After it was reported, the outpour of hate and angry messages had came in. The incident started when people noticed the boy’s lead for help inside the BMW. A crowd had gathered around the car as the child pleaded for help. They were surprised to see the mother standing outside the car and she seemed unmoved by the scene. The boy grew weaker and the firefighters tried to break the BMW’s window. To their amazement, the mother tried to stop them and insisted that they should wait for the locksmith to open the door instead. She said that she did not want to damage the car. The firefighters ignored her plea and smashed the window to get her son out of the car. According to one of the firefighters, it is dangerous to leave the children inside the car. The heat inside the car can instantly rise and may endanger the life of a child locked inside the car. Netizens posted their angry remark’s on the woman’s actions and many had voiced that the car seemed to be more important to her than her son’s life in danger and her behavior not acceptable.